If you love DIY projects and home renovation, you’ve come to the right place. There’s always something that you can make to renovate your home without spending a lot of money, and now we’re going to look at ten DIY projects for your home. All of them are easy and budget-friendly ideas that you can accomplish in one hour or less. Chances are you bought your coffee table or other wooden furniture in your home a long time ago, so they don’t look as fresh as they were. There is, however, a way to revive them. This easy way involves using coconut oil. Besides the oil, you need smooth cloth and a tablespoon. To begin, apply coconut oil to the wooden surface and then wipe it using the cloth in a circular motion. You’ll see immediate results because the oil will penetrate the wood and give it an entirely new look. The secret of a glamorous and stunning hotel room is a nice bed. That’s why every hotel tries to make beds look nice and comfy so the guests feel like home. You can dress your bed like they do it hotels as well. For that, you don’t need to buy expensive bedding. Adding more pillows to create more layers will make it look cozy and nice, and if you pick appropriate colors and fabrics, your bed will have that “hotel style” look. If elegance is your goal, this project is for you. Giving your switch plates a makeover to make them look more elegant is one of good ways to get the look you want. For example, you can visit a thrift store and buy some small picture frames that you’d like to use as frames for switch plates. We recommend you take one of your switch plates with you to make sure that everything will fit nicely. It’s okay if colors of the frame you selected and your switches don’t match – you can always spray paint them. 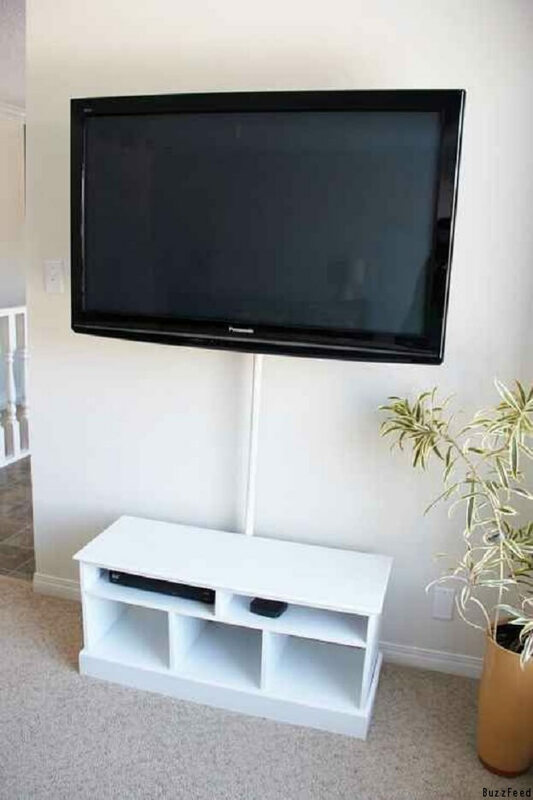 If you have a mounted TV at your home, you are probably familiar with this problem: there is a bunch of wires cluttering the space around the TV and laying on the floor. Many people try different methods to hide the wires and make sure they don’t run the décor. For example, you can go to the craft store and purchase some covers like a shower curtain rod to hide them. Make sure that you have enough length to hide all those pesky wires. P.S. Shower curtain road works perfectly with a mounted TV. This DIY project was recently featured on Creative Chicago and it received a lot of feedback. The vase is actually an empty can (tomatoes, kidney beans etc.). By winding the rope around the can and securing it with hot glue, you can get a great vase for your pencils and flowers. Very cheap and simple. This is a pretty simple idea that makes an impressive design solution. By adding a frame to your TV, you’ll give it a totally different look that will change your living room. If you have picture frames on the wall, try to pick something that goes well with them. Are you bothered by all those cords lying around the working area in your living room? Just make a roll with washi tape and reinforce with toilet paper rolls and use some scotch tape to hold the two ends together. Now, you can stuff your cords inside. Satisfy the restless designer in you by decorating some jars that could hold cotton balls and cotton rounds in. Just clean some pickle jars, glue the knob so you can easily open it and in the end, you’ll get a pretty cute storage jar. You know those quotes in frames or posters that many people have in their homes? If you still don’t have this art, you should definitely get it because it is one of the latest home design elements (plus, it can be motivating). If you like to decorate your fridge with magnets, this project may be for you. Pick up a design of appropriate size and fit it into a bottle cap. Put a dot f a glue on the back of the cap and stick a magnet on it. Hope these great DIY projects were inspiring to you to upgrade your home design!